Home Travel Italy Gelato! Milk not required. gelato by TimRT. Creative commons license. Last time I said gelato deserved its own post, so let’s talk gelato. Along with bruschetta, gnocchi and pizza, this has got to be one of the best things that has ever come out of Italy. If, by some great misfortune, you have never had the pleasure of experiencing gelato for yourself, let me start by saying that gelato is simply the Italian word for ice cream. Except that it’s so much more than that. Creamy. Smooth. Bursting with flavor. 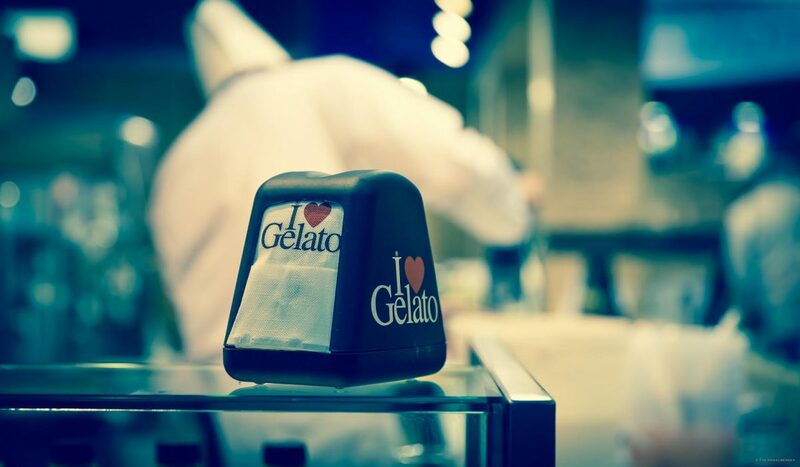 The production, and even the serving, of gelato is a work of art in Italy. This heavenly concoction is not rolled up into a ball with an ice cream scoop and plonked into a bowl. Ooooh no. It is worked back and forth with a spatula until it reaches just the right consistency, and then it is slathered into a cone or cup, mostly likely on top of another scoop of a different flavor. Because in Italy, even if you order the smallest cone available, you always, ALWAYS get two scoops. Two scoops! To see this living art in action, complete with running commentary by an enthusiastic Italian onlooker, have a look at this video. gelato attack by Robyn Lee. Creative commons license. 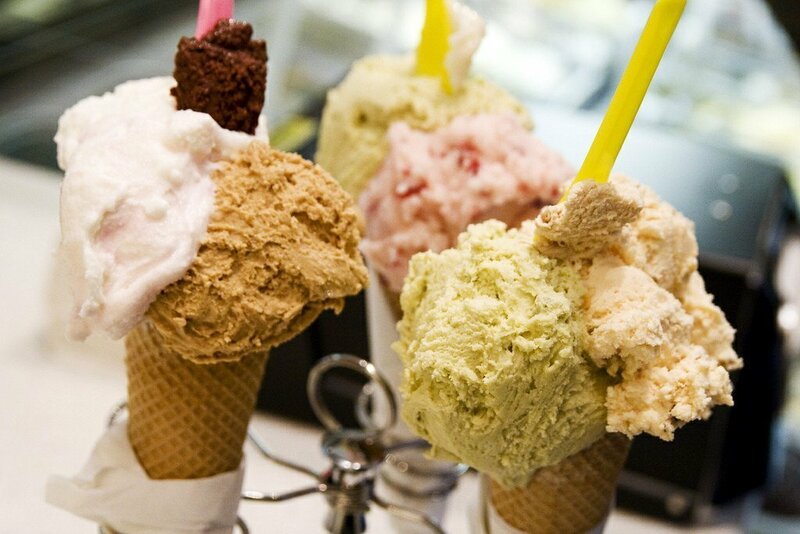 As business owners become more attuned to the dietary needs and choices of their clientele, these days an increasing number of gelaterie in Italy are offering a few flavors made with soy milk instead of cow’s milk. While this is definitely a boon for vegans and should be applauded, many vegans seem to mistakenly believe that they are limited to only those soy flavors. Not so, my friends! In my opinion, some of the best gelato flavors of all are the fruit flavors, and these are almost always sorbets, meaning they are made from fresh fruit, water and sugar and are naturally dairy-free! Of course, you should always ask to be sure (especially if you’re ordering gelato in the US, where egg white is sometimes added as an emulsifier), but any fruit flavor is generally a pretty safe bet, as is the dark chocolate flavor (fondente in Italian). 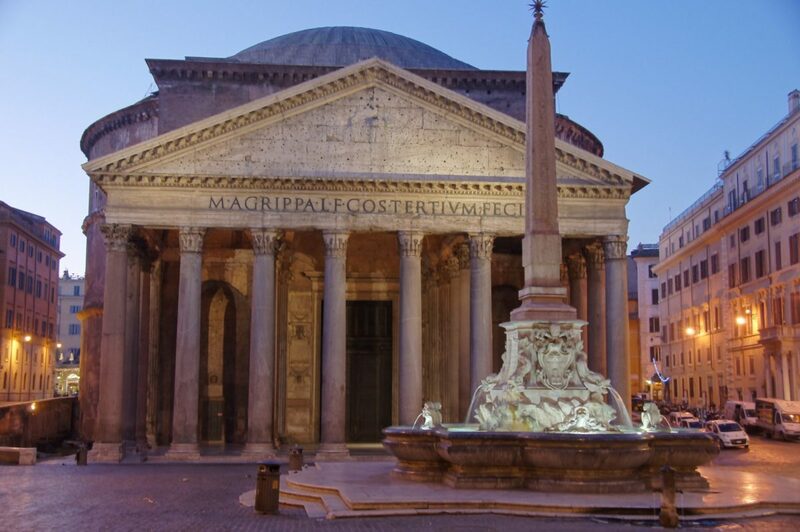 Apart from its proximity to the Pantheon, the major drawcard here is the variety; this place prides itself on producing more than 150 different flavors, more than 50 of which are fruit flavors. Now, they won’t necessarily have all of these for sale on any given day, but they will have plenty, you can be sure of that. Ciao bella! Look, we’re topped with real fruit pieces! We’re piled up into fun swirly shapes! Our spatulas are all standing at attention, ready to scoop up some fruity deliciousness just for YOU!! Hi (spoken in Ross Geller’s voice from the Friends pilot episode). We’re soy gelato. We come in drab colours. We’re healthy, but we’re boooooring. Luckily, almost all the flavors in the top photo are also vegan friendly, so you don’t have to miss out on the fun. When I asked the guy behind the counter I was told that all the fruit flavors on display that day were dairy-free, apart from the banana and the coconut. And, since coconut also came in a soy version, that really only left out the banana. In the end, I chose passion fruit and coconut, but obviously, the possibilities are endless. Now, I have seen a number of negative online comments from tourists about this place, mostly complaining about the service. It’s true that the service is not always that friendly, but to be honest, smiling at every customer and telling them to “have a nice day” is not really part of Italian culture, especially in heavily touristed cities like Rome where, frankly, the locals get a bit fed up with foreign tourists who don’t understand how things work. The most important thing to remember here is that you should not go up to the counter where all the gelato is and just wait to be served. You will be waiting a looong time. Instead, you should go to the cash register at the back of the store, pay for what you want, then bring the receipt up to the gelato counter and wave it until a staff member grabs it, then you tell them what flavors you want. This applies not just to Della Palma but to all cafés, snack bars and similar establishments in Italy. Blue Ice: A chain with several locations in Rome, this gelateria serves up huge portions and offers a decent selection of both fruit sorbets and soy gelati (see website for a list of flavors). GROM: Also a chain, GROM prides itself on using only the freshest organic ingredients. Their website has a section called “intolerances” that clearly shows which products contain eggs or dairy. All the fruit sorbets are vegan. 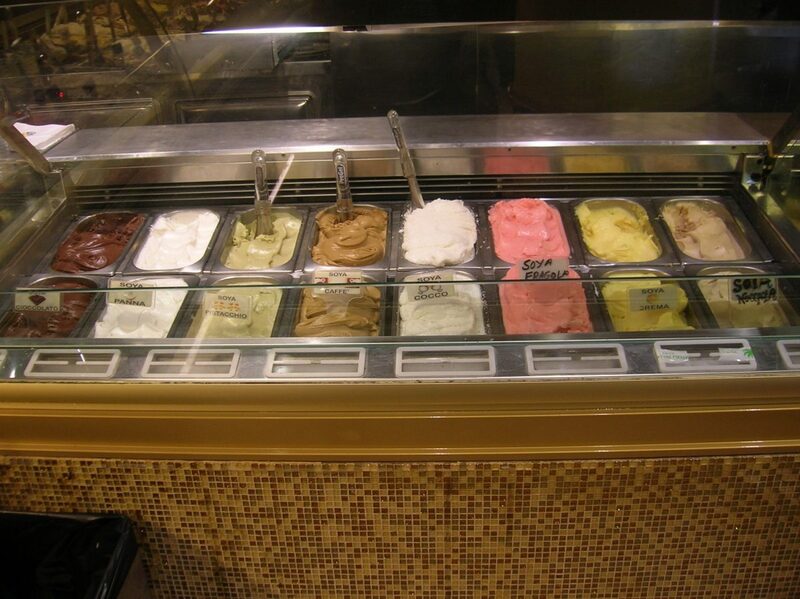 Fatamorgana: This is a relatively new chain of gelateria that did not yet exist when I lived in Rome. Based on their website and the online reviews I’ve read, I would love to check it out the next time I’m in town. They offer a wide selection of unusual sorbet flavors like elderberry, persimmon and alkekengi (bladder cherry). And don’t rule out the other flavors either; the exact ingredients of each flavor are clearly listed on their website, and just poking around I came across at least one – dukka – that was completely vegan. So that should be enough gelato to keep you busy for a while! Yum yum yum, those gelati look awe-SOME! Indeed they were! I can’t wait to go back and try more flavours. That sounds great! I spent a year in Rome but haven’t been there for quite a while. I have been on a vegan diet for some years now and I love icecream. Finding vegan icecream is not alway easy around here as I prefer dark chocolate to most sorbets. A reason to go back to Rome at least for a visit 🙂 Anywhere, thanks for sharing your wonderful blog! Thanks for your lovely comment Anja! I love dark chocolate too (and Rome, of course!). Here in Geneva I know of two gelaterie, Manu and Gelatomania, and they both have vegan dark chocolate gelato, so it’s always worth asking about it. Frozen in Milan, has vegan gelato to die for. They use rice milk as their base. So yummy. Wait, I messed up. That’s Gelateria Stefino in Bologna that uses rice milk for their base but Frozen still has amazing gelato! Great, thanks for the tip! I’ve seen plenty of gelaterie that offer soy-based gelato, but I don’t think I’ve seen one with rice milk. If I’m ever in Bologna again I’ll be sure to check it out! Ah, this is a common misconception that probably arose because the Italian word “gelato” sounds a bit like the English word “gelatin”. But in fact, the two have nothing to do with each other, and Italian gelato is not made with gelatin. At least, I’ve never come across one that was, and it’s certainly not part of the traditional recipe. 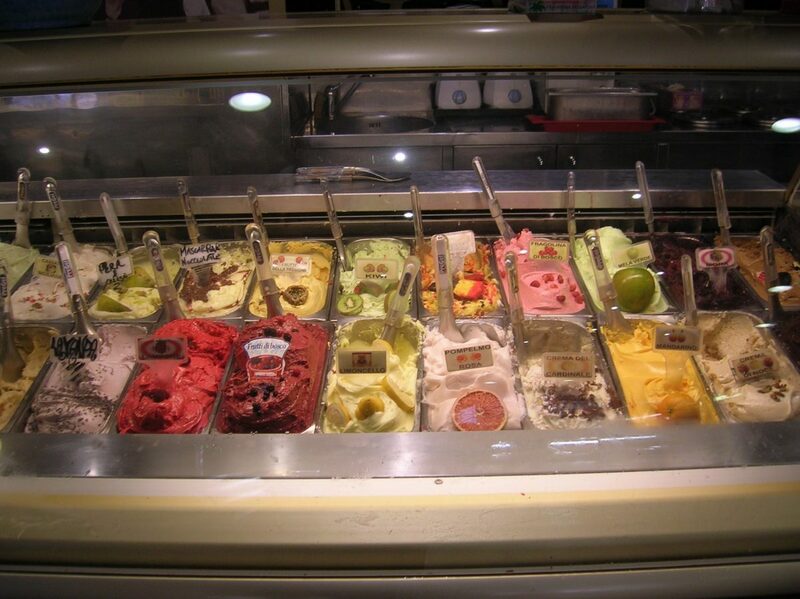 The word “gelato” comes from the Italian word “gelare”, which means “to freeze”.